Founded in 1961 by six outdoorsmen, the Riverside Mountain Rescue Unit (RMRU) today comprises 30 volunteers trained and ready to respond to wilderness emergencies – at any hour of the day – regularly leaving their jobs or warm beds in the middle of the night to respond to a call for help. The unit, governed by the Riverside Sheriff’s Department, is a non-profit organization that supports law enforcement agencies, national park and military officials in their search-and-rescue (SAR) efforts. The mountaineers specialize in high-angle rope rescue, and extended back country and mountain rescue missions. The small yet spirited group of volunteers are on constant alert, relying on Mission Manager and other tools for callouts ranging from lost and injured hikers, skiers and rock climbers to missing children and Alzheimer’s patients. And their efforts have not been in vain. Averaging 40 missions per year, the unit has saved over 1,000 lives and conducted approximately 2,000 missions since it was founded. About 95% of its missions are within Riverside County Calif., a 7,206 square-mile-area equivalent to the size of New Jersey that spans from the Greater Los Angeles area to the Arizona border. The volunteers have also traveled into Mexico, the High Sierras and Nevada to accomplish their lifesaving missions. 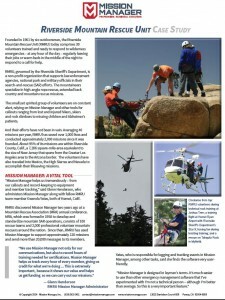 “Mission Manager helps us tremendously – from our callouts and record-keeping to equipment and member tracking,” said Glenn Henderson, who administers Mission Manager along with fellow RMRU team member Gwenda Yates, both of Hemet, Calif.
RMRU discovered Mission Manager two years ago at a Mountain Rescue Association (MRA) annual conference. MRA, which was formed in 1958 to develop and standardize mountain SAR operations, consists of 100 rescue teams and 2,000 professional volunteer mountain rescuers around the nation. Since then, RMRU has used Mission Manager to support approximately 120 missions and send more than 20,000 messages to its members. Yates, who is responsible for logging and tracking events in Mission Manager, among other tasks, said she finds the software very user-friendly. In terms of funding, the unit needs at least $1,250 per month to run it growing operations, and it relies heavily on private donations. The Riverside Sheriff’s Department has provided RMRU with much-needed support, including rescue vehicles and gasoline for its missions. It also provides air support for SAR operations – either their own helicopters or those from neighboring counties or military bases. For large-scale missions, the Sheriff’s Department will roll out its mobile command post for the unit. The members must also provide their own equipment at a cost of more than $2,500, including climbing ropes, harnesses, bivouac shelters, helmets, first aid gear, wilderness survival clothing, radio equipment and misc. hardware. Each member also donates to the unit’s account to help fund the team’s gear and send a member to conferences sponsored by MRA and National Association for Search and Rescue (NASAR). Additionally, team members spend one weekend each month training to sharpen their rescue skills. To get field-certified by MRA, members must also pass an annual field-qualification test that involves hiking up the steep 2 ½ mile Devils Slide Trail in Idyllwild, carrying a 30-pound backpack, within a 45-minute timeframe. The other recent missions had happier endings, including searches involving a missing 11-year-old girl in Moreno Valley and a developmentally challenged 19-year-old man who wondered off in Wildomar. Other success stories involved hoist evacuations for hikers in the Corona foothills, the San Jacinto Mountains and Gillman Hot Springs.